Being Irish? St. Patrick’s Days? What’s it all about? To quote a certain Mr. Freud “This is one race of people for whom psychoanalysis is of no use whatsoever.” I think we are currently in a state of an identity crisis following our well-documented disastrous flirtation with economic revelry and the constant ego-boosting buying of ‘fineries’. But what of us now? In a strange way, I feel that we are beginning to reclaim our individual personalities after many of us skirted towards becoming cloned consumer-conscious robots during the hay-days. We lost our individuality ‘keeping up with the Jones’ – flouncing off on skiing trips, retreating to 5-star spa hotels and brand shopping – mostly because everyone else and the media told us that they were doing it. Then we reached pressure point. 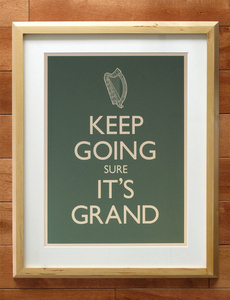 We kept going in the hope that, ‘sure it’ll be grand’ – that staple reassuring Irish answer for everything!. Then the bank balances began to dwindle, or at worst, there was no more 9-5 for you. But how could we say we couldn’t afford that dinner with the girls in the ‘really nice’ restaurant that would set you back the price of a good pair of much-needed winter boots? What excuse could we make for not being able to go on the weekend trip to New York? It was hard for us to admit personal economic set-backs and we all at some stage suffered from FOMO (fear of missing out). Now that the ski trips are gone, the spa breaks no more and we have reverted back to the ‘power of the bargain’ over mindless brand shopping. I feel much more at ease, and it seems my friends do to. With monetary restraints, we are more choosy about how we spend the money and time we once threw away. I feel that by default, this actually allows us to express our personalities much better. We are now concerned again with the things that mean the most to us – not the consumer trash we all thought we needed because everyone else had it. Are we better off for not being as well off? For sure we are! Yes, we still have the worries, but our individual personalities are shining through and we are all taking stock of our lives. We are finally expressing our individuality again, are open about our struggles and dreams and so build stronger relationships as a result. Some of us are even finally getting to do what we always wanted to do, whether it be writing, cooking, music making or yoga teaching! But the odd flash of madness still bolts through however and Freud was probably right in what he said!